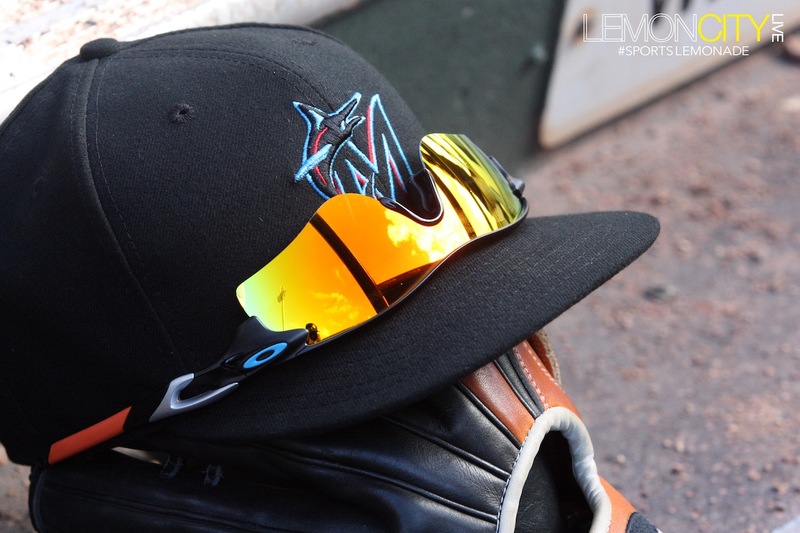 Jupiter, FL – Jose Ureña and Caleb Smith made their final spring training appearances as the Miami Marlins were blanked by the Houston Astros 5-0 Saturday night at Roger Dean Chevrolet Stadium. Seen as a tuneup before Opening Day for Ureña, Smith’s last chance to make a case to be a part of the starting rotation suffered a setback late in the game. Taking over in the fourth, the ‘Stros recorded their first hit and knocked in a run, an RBI single by Yuli Gurriel. From there Smith held steady until the eighth frame. He was lit up for four more runs. Houston heavyweight George Springer smacked a two-run double and Jose Altuve followed up with a two-run blast to left field, ruining an otherwise good performance by Smith. He recorded six strikeouts. Miami’s bats were anemic meanwhile, with Jorge Alfaro, Lewin Brinson and Garret Cooper the only Marlins who managed a hit. During the game inside the team clubhouse, Cooper was cautiously optimistic about his chances of making the starting roster. “You know, until everything’s officially announced it’s up in the air but I’ve had a really good spring and you know I’ve fought through a long road to get back here, ” Cooper said. The 28-year-old made the opening day roster last year, only to go down to an injury in the second game of the season due to being struck by a pitch on his right wrist. He only had 33 at-bats in 2018. Spring training is winding down but roster activity is ramping up. As Opening Day nears, the Marlins have already made several moves. Peter O’Brien was optioned to Triple-A New Orleans, joining Austin Dean and Jarlin Garcia. The move seems to favor Garret Cooper, opening the rightfield spot. By the looks of it, the OF corps will be Curtis Granderson in left, Lewis Brinson at center and Cooper to right. Cooper could also see playing time at first base. O’Brien played in 18 Grapefruit League games, hitting a .220/.353/.390 slash line. He also hit one home run, four doubles and 11 RBIs. Initially, O’Brien was being looked to as possibly the clean-up hitter to fill the power void. In March, the 28-year-old hit .300/.450/.533 after struggling mightily out of the gates. That changed with the grand slam on March 10th against the Braves. Despite these transactions, the Marlins rotation has had a lot of activity but little clarity on who the Starting 5 (Or 6) will be. Dan Straily, the projected No. 2, started on Friday night against the Nationals in Jupiter. He finished with five and a third innings pitched, allowing four runs (two earned) and four strikeouts. Fellow right-hander Sandy Alcantara got in some work, throwing six innings in a Triple-A game. He allowed just two earned runs while striking out seven and walking one. Even Trevor Richards is busy as he is scheduled to pitch in a Minor League game. Houston scored 5 runs on 10 hits, no errors. The Marlins only managed three hits. The Astros win the spring training set 4 games to 2. Miami’s 11-game winning streak (March 8-March 21) ties their own franchise record. It is also the longest streak by any team during Spring Training. The original record was set back in 1997, could it be a sign of good things to come? The Marlins held a March Madness-style double-elimination ping pong tournament. Cooper was the last man standing, beating Martin Prado for the championship. He will face the Minor League winner for a chance to be the champ for the entire organization. Miguel Rojas had a deep run while Alcantara was knocked out early by Dean.